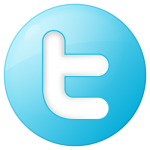 The company I work for has recently conducted a reorganization company wide. During this change, a couple of people who worked directly with my customer decided to leave. Honestly, I was extremely happy when I heard the announcement of the departure of one particular individual! The guy simply had an agenda and goals that did not align with the rest of our company or our Team. Once I learned of his resignation, I determined that it was time to celebrate with a really good glass of wine! The Fortis label was inspired and created in 2003 by winemaker Stacy Clark, who is now making wine at Charles Krug. 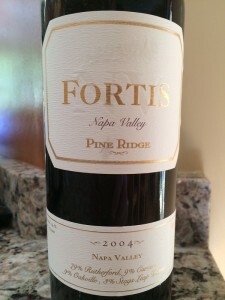 She describes the 2004 Fortis as awash in aromas of ripe red berries, cherry and blueberry fruit, with accents of tea, dark cocoa and tobacco hinting at further complexity and potential. Medium to full-bodied with superb concentration, sweet cherry and redberry fruit flavors with firm, silky tannins. The 2004 boasts exceptional length with notes of berry and tobacco leaf rounding out the finish. Fortis, an ultra-reserve red wine, by carefully constructing a tête de cuvée (A wine produced from the first pressing of the grapes, generally considered superior in quality. Usually merits bottling under a prestige label) from those vineyard blocks and sub-blocks that emerge as standouts from the vintage, regardless of varietal or appellation. No parameters have been set, and no boundaries established. The 2004 vintage only produced 859 (750ml) cases, in addition to 1.5L, 3.0L, and 6.0L formats. Aromatic, young-fruity with aromas of sweet dark fruit, blueberry, caramel and chocolate. Dry, full-bodied with balanced acidity. The tannins were medium but soft. There were rich round mid-palate flavors with a silky long finish. How much: $135.00 (slightly pricey for most) The news justified its enjoyment! Composition: The 2004 Fortis is 100% Cabernet Sauvignon from the following AVA’s: 74% Cabernet Sauvignon, 10% Merlot, 9% Malbec and 7% Petit Verdot. Aged in 75% new French oak barrels for 14 months. 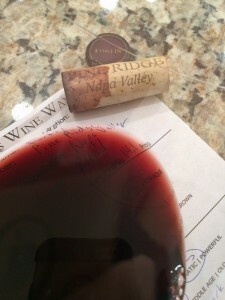 I rated the 2004 Pine Ridge Fortis four glasses. Many times we do not finish a bottle of wine. There was no way we would save this one for tomorrow!